What a joy to get out in the garden with a drink and a copy of the racing post now that we have something approaching some sun and warmth. It’s been a good week on the cigar front. 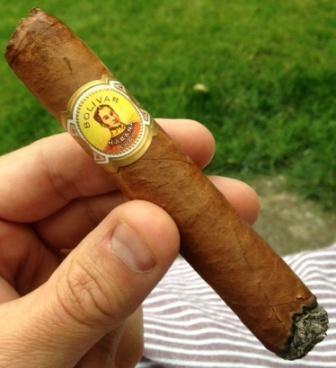 Last Sunday started with the Bolivar Royal Corona MUR JULY 2012 – see right – a chunky and rich even slightly heady and dense smoke. It is often said that when starting to “lay down” a cigar stash that you should start with some Bolivars. I can see why. This was full bore and as young as the date suggests. I will be leaving the rest of these that I have for 18 months or so. If I had to liken it to a wine it would be Cornas or a traditional Cote Rotie, hard and dense with a long life ahead of it. 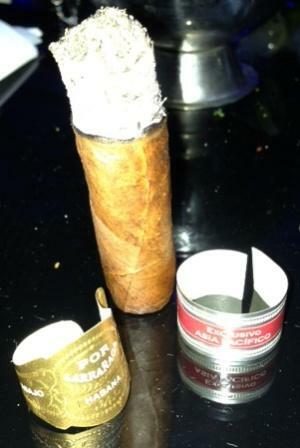 Tuesday evening saw an early evening trip to The Mayfair Hotel’s cigar bar, where Mr Sabourin brought along a couple of Por Larranaga Belicosos Extra’s (see top and bottom). A limited edition for The Asia PacificRegion from 2008. 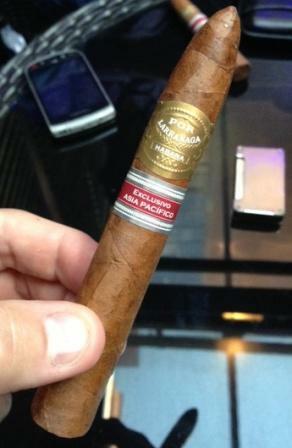 These, as all Asia pacific releases are supposed to be, are meant to improve with age and I would say these are just starting to hit their stride now, there is that hint of caramel you should get from Por Larranaga but also a great depth and a lovely amount of heavy silky smoke, overall they are on the rich side of medium…really cracking. Thursday evening was just one of those when you get back home and go straight to the fridge for cold, and not especially serious white wine then after dinner want a smoke that requires little if any concentration. 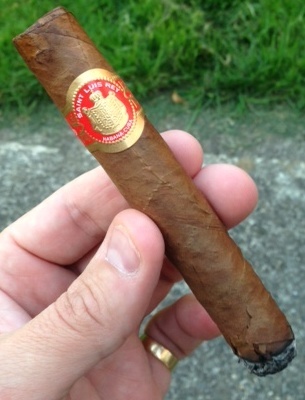 I went for a Saint Luis Rey Regios and it turned out to be a great choice, straight into stride and just under medium, lovely weight, great mellow tobacco on the tea and straw side flavour wise. The smoking equivalent of a pint you know you like and that flies down quicker than it should. All three smokes were good, Bolivar to lie down, Por Larranaga for those more serious moments and the SLR Regios for instant gratification..I need to buy more of the latter as a priority! !